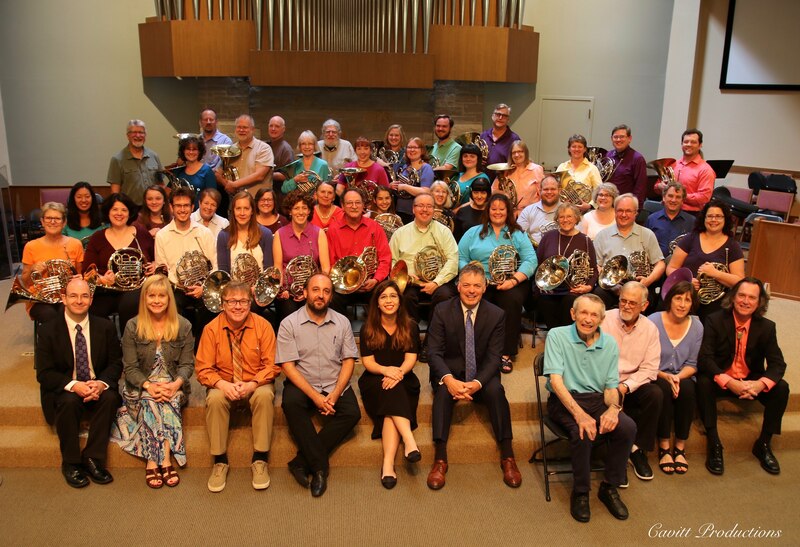 September 10, 2017 performance "Celebrating Horn Ensembles"
40 TCHC members who played this concert! The Twin Cities Horn Club (TCHC) was founded in 1963 by Minneapolis businessman, Bill Lind. In those early years, members included musicians from the Minneapolis Symphony (now Minnesota Orchestra), Saint Paul Chamber Orchestra and freelancers, including Bob Elworthy, Bruce Rardin, Frank Winsor, Eugene Wade, Dave Kamminga, Bill Melby, Paul Binstock, Elaine Davis, Marv McCoy, Karen McCoy, Curt Blake, Leslie Blake and Chuck Kavalovski. In the 1980’s Charles McDonald expanded the membership to include more musicians from community ensembles. Frequent guests included Chris Leuba and John Barrows, with Barry Tuckwell, Phil Myers and Frøydis Ree Wekre stopping by occasionally. Today, the TCHC has over 250 member musicians, from high school students to professionals, and a vast printed music library of over 450 titles! When Herbert Winslow joined the Minnesota Orchestra as associate principal horn in 2005, he already had a long relationship with the Orchestra-he had performed as acting associate principal horn in Sommerfest concerts since 1993 and served in that role throughout the 1994-95 season and the Orchestra’s 2004 European tour. Prior to his position with the Orchestra, Winslow served as principal horn of the Saint Paul Chamber Orchestra, a post he held from 1981-2006. In addition, Winslow spent three summer seasons as principal horn of the Santa Fe Opera and served as assistant principal horn of the New Mexico Symphony. While still a student at the Curtis Institute of Music, he played with the Philadelphia Orchestra as a substitute and extra musician, serving as assistant principal horn in 1975. Winslow has performed extensively as a chamber musician; from 2002-2004 he played in the Bay Chamber Music Festival’s First Chair All-Stars series in Rockport, Maine, joining principal players from orchestras in Philadelphia, Boston, New York, Chicago, and Montreal. In demand as a teacher, Winslow has been an adjunct faculty member of St. Olaf College since 2001and was an affiliate faculty member of the University of Minnesota from 1989-2007. He was also on the faculty of the University of New Mexico from 1977-1981. He has presented masterclasses around the country, including schools such as the Cincinnati Conservatory of Music and Indiana University. Winslow studied with Ethel Merker at Indiana University and earned his B.M. degree from the Curtis Institute of Music, where he studied with Mason Jones.